Have you ever done anything you really don’t want to do in order to help someone else? 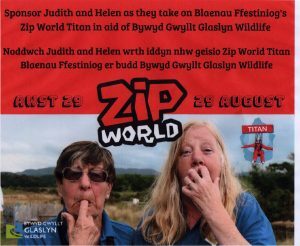 Well, Judith Babbage, one of our longest serving volunteers, and Helen Wood, a former GP have agreed to ‘fly’ down the ‘Titan’ zip wire in Blaenau Ffestioniog on 29 August to raise money for BGGW. If you would like to sponsor Judith and Helen here’s how to do it: Donate Here.